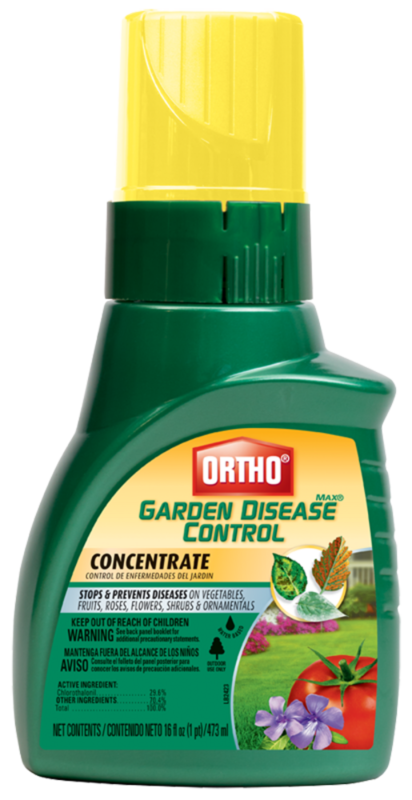 Protect your garden against diseases including rust, leaf spots, blights, mildew, and fruit rots with Ortho® MAX® Garden Disease Control Concentrate. It stops and prevents existing and future diseases. Dilute concentrate according to the label directions, and use on listed vegetables, flowers, fruit trees, and ornamentals to control diseases. Coverage area varies by specific plant and disease (see label). For use on listed vegetables, fruit trees, roses, flowers, shrubs and shade trees (see label). Application instructions vary by plant and disease type. Spray thoroughly to cover all plant surfaces. See label for specific instructions. Diseases controlled include leaf spot, mildews, rust, fruit rot, scab, molds and several others listed on label. VEGETABLES & MELONS: Beans (Green),Broccoli,Brussels Sprouts,Cabbage,Carrots,Cauliflower,Celery,Corn (Sweet),Cucumbers,Garlic,Leek,Melons,Onion,Potato,Pumpkins,Shallot,Squash,and Tomato.